Can you identify the woman and child in this photograph? 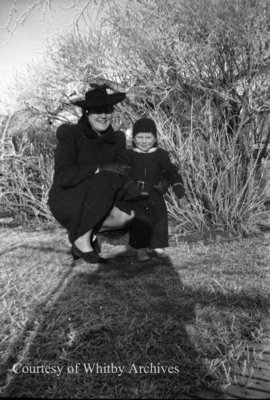 A black and white medium format negative of an unidentified woman and young child taken outside. In this view the woman is kneeling down with her arm around the young child. Unidentified Woman and Child, c.1940s, Marjorie Ruddy. Whitby Archives A2013_040_409.